Tags: Decorating, DIY Projects, DIY Home, Home and Decor, Knock It Off! DIY Projects, Knock It Off! Marble is a classic, gorgeous choice for kitchen counters, but it's so expensive. 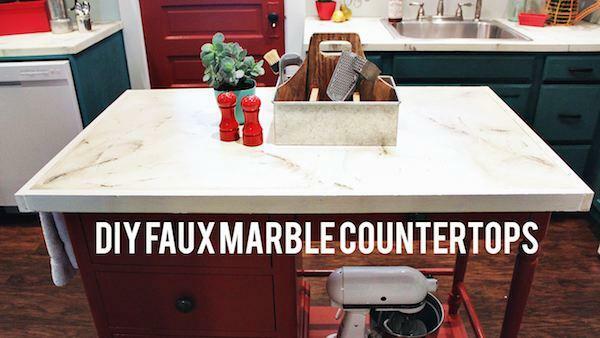 Here's how you can fake the look of marble countertops for next to nothing with just paint! 1. Begin by cleaning your surface very well and sanding any rough spots. Wipe down. Then prime the counters using primer. We did this right over top of the homeowner's existing laminate counters. Goodbye laminate! Sand the surface lightly after the first coat, wipe down with a damp paper towel, and paint again with the primer. 2. Once the primer has dried, paint the surface with a small foam roller and the white paint. Use an angled paint brush to cut in the edges. Let dry. Sand lightly, wipe down and paint again. Do this several times so that your finish is really nice and smooth. 3. To create some depth, lightly sponge the entire surface with the lightest shade of gray paint and let dry. 4. Use a piece of marble as an example to see how the veining runs. Try to mimic that look when you're painting. Water down your craft paint, by mixing 4 parts water to 1 part paint- you want it to be nice and thin. Dip the feather or leaf into a medium shade of gray paint and drag it across the counter at a diagonal, wiggling it back and forth as you go. This will create a more realistic line. You don't want solid lines here. 5. While the paint is still wet, spray the counter with a water mist from about 10 inches away to soften the lines. Spray a few larger areas to blur the lines even more. If necessary, use the bristle brush and sponge to correct any mistakes and remove excess water. Repeat this process until you're happy with the result. 6. Use a darker shade of gray to accent the veins you already made. Spray again with a light mist of water and let dry. You can add another shade of gray if desired to make it more realistic and have more depth. Let dry. 7. The last step is to seal the surface to protect it from water damage. We used a spray polyurethane that is designed for this type of surface. Just make sure to use a water-based poly, or your counters will yellow over time!